Rabbit anti Bovine, Canine, Equine, Guinea Pig, Human, Mouse, Porcine POT1. 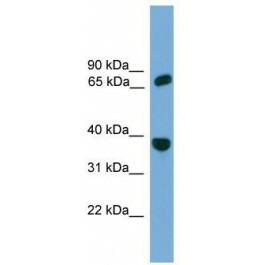 The immunogen for anti-POT1 antibody: synthetic peptide directed towards the middle region of human POT1. Synthetic peptide located within the following region: MNSENQTMLSLEFHLHGGTSYGRGIRVLPESNSDVDQLKKDLESANLTAN. This gene is a member of the telombin family and encodes a nuclear protein involved in telomere maintence. Specifically, this protein functions as a member of a multi-protein complex that binds to the TTAGGG repeats of telomeres, regulating telomere length and protecting chromosome ends from illegitimate recombition, catastrophic chromosome instability, and abnormal chromosome segregation. Increased transcriptiol expression of this gene is associated with stomach carcinogenesis and its progression. Altertively spliced transcript variants have been described.